The aircraft Boeing 737-500, with 50 people onboard that crashed at the Kazan airport on November 17, was previously owned by “Bulgaria Air,” wrote Russian media. During the unsuccessful landing attempt, the Boeing exploded, killing all passengers and crew. Irek Minnikhanov, son of Tatarstan President Rustam Minnikhanov, and Alexander Antonov, who headed the Tatarstan branch of the Federal Security Service, were among the victims. TIM, however, did not miss to pocket the lease payments, amounting to $150-160 thousand per month and $100 thousand more for spare parts. “Everything the Bulgarian consultants do today in “Tatarstan” airline revolves around ensuring timely lease payments for the airplanes they have provided. Bulgarian colleagues are conducting global optimization and cost reduction in the company through cuts of wages and social benefits, while they continue to live in luxury hotels that cost the company more than half a million rubles a month,” the outraged authors of the open letter wrote, quoted by the website “Business Gazette.” According to them, in order to be profitable, the old machines needed to fly 250 hours a month, but due to frequent repairs, the three Boeings could not execute more than 120 flight hours. Eventually, in 2012, the Government of the Autonomous Republic of Tatarstan decided to terminate the unfavorable cooperation and transferred the airline to the holding company “Ak Bars.” A year later, however, people from TIM, had still not fully left the airline. 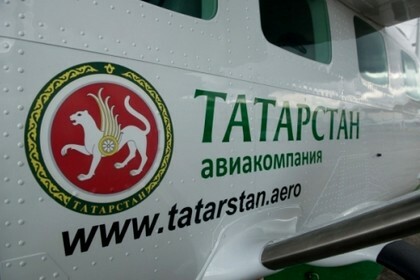 According to data from September this year, quoted by the newspaper Kommersant, the owner of “Tatarstan” airline is the company “Tat Aero,” which belongs to the Republic of Tatarstan (50% and the remaining shares are owned by companies related to TIM – “Bulgarian Aviation Group” and “Eskana Russia,” having 25%). TIM interests in Russia and Kazan are not limited to aviation business. An investigation of Bivol showed that they also own the bank “TatInvestBank.” These people from Varna enjoy high-level patronage, straight from President Putin’s entourage. Former Minister of Natural Resources, Yuri Trutnev, who was adviser to President Putin, and recently was also Deputy Prime Minister, is a passionate karate fan. Along this line, he is friend with former commando Ivo Kamenov from TIM. Both are cofounders of the World Union of Kyokushin Karate Style. However, Trutnev’s ties with TIM are not limited to karate. Trutnev’s son, Dmitry, is the manager of “TatInvestBank” and is also a financial advisor for the Bulgarian Central Cooperative Bank, CCB, owned by TIM. Photo: Former Minister and current adviser to Putin, Yuri Trutnev (center, with blue tie) and Ivo Kamenov from TIM (center, in black jacket and turtleneck) are cofounders of Kyokushin World Union. “The up-and-coming star of Bulgarian organized crime, the Varna-based TIM group, is increasingly resembling MULTIGRUP in its successful efforts to permeate as many legal and illegal sectors as possible; currently, TIM and its subsidiary business empire is one of the largest and most serious economic concerns in Bulgaria. As an organized crime group, TIM is involved in a wide range of criminal activities, including extortion and racketeering, intimidation, prostitution, gambling, narcotics trafficking, car theft, and trafficking in stolen automobiles. TIM’s home base of Varna has a large Russian population, and TIM is thought to have connections to Russian organized crime,” writes Pardew.